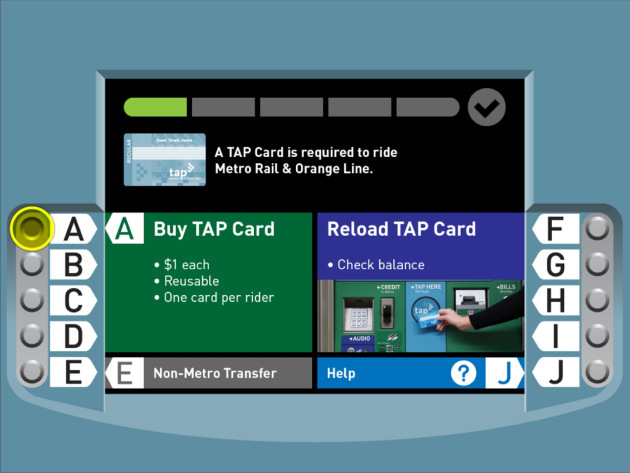 Steven White, who runs the “Accidental Urbanist” blog, has a good breakdown of the revisions in the works to help Metro customers more easily buy and replenish TAP cards at Metro ticket vending machines. If you’ve ever stood at a TAP Vending Machine, wondering where to start, how to continue, or when the transaction is finished, you may be pleased to hear this news: The TVM screens and software are getting a refresh. Give credit to Metro, they understand that the current TVMs are confusing and have put together some new teams of people to address the problem. I was invited, along with some other bloggers and journalists, to view a preview of the new screens. At this point, it wasn’t a working beta on an actual machine, but the visual and experience design for what the process would be. The great thing about this meeting is that it was not a media presentation showcasing the finished new system, but rather a sneak peek at the in-progress ideas. Metro is stressing that these designs are not final, and that they want feedback on them as they continue to change and revise them before rolling anything out. Please see Steve’s blog post for more details and his comments on the changes. He has also posted many more slides; please keep in mind that these are still in-the-works and not finalized yet. I’ve loaded fares on my TAP cards at ticket machines so many times that I know the drill and it’s not a difficult task. That said, almost every time I wander near the machines with my Metro ID card around my neck, I find myself answering questions from customers. Helped confused newbie @metrolosangeles riders buy TAP card 2 ride Expo Line 2 get 2 Dodger Stadium. Metro must simplify ticket machines! a bit off topic: hows come the arrival time screens in the red/purple escalators/stairwells show red/purple times on the screen you say on your way OUT of the red/purple. It seems to me that those screens should show the gold line arrivals and maybe some bus arrivals. Why would someone want red/purple fines when they just got off the red/purple. They need to see times for something they might transfer to. Gotta improve the “depressing” lighting at the 7th & Metro station, next. A very “busy” underground redline station with minimal lighting. Looks ghetto-ish. Metro should ‘copy’ the great lighting effect, from the Universal City redline station …bright & cheery ! will i be able to get an EZ Pass through the vending machine when these updates go live? I’m not sure. I’ll try to find out. One thing they HAVE to add is allowing people to add ANY amount of money/credit onto their TAP cards. I can do this when I buy credit at manned agencies, etc. Why do I have to insist on adding only multiples of the $1.50 fare? This assumes that I only use the TAP card for Metro Rail and Bus…. but I can use TAP on DASH as well as countless other LA-area transportation agencies. Let’s not be so shortsighted on this one. When sub-$200 Android tablets can have highly responsive touchscreens with a brilliant HD display, why does a several thousand taxpayer dollar TVM with very poor resolution have to use hard to press metallic buttons? If you want to add in $58.37 you can do that. You have the ancient keypad (when everything is touchscreen these days) there so make good use of it. Besides, TAP should start looking at more opportunities than just being used to pay for transit. Why is it that the rest of the world has great things like being able to use contactless cards to actually buy goods and services yet we’re still trying to solve how to use it only for buses and trains? Man, we’re so behind. It’s a contactless transit card as well as a Mastercard so you can use it anywhere from riding buses, trains, as well as buying goods and services. You add in $50 and not only can you ride Chicago transit, you can go to 7-Eleven, Walgreens, Starbucks, practically anywhere they take Mastercard and use it to buy anything. And unlike the stupid TAP ReadyCard, it has no stupid monthly fees attached to it just to keep the card active. I actually brought up the “key in any amount you want to add to the card” issue in the meeting. The basic reason you can’t do this is because the machines would then have to stock bunches of change in various denominations. While I don’t know exactly what’s inside them, they’re able to get by now with just dollar coins and quarters. These are really going to be the most used, so it makes sense to use the physical space to stock as many of them as possible, rather than having to stock a bunch of pennies for someone who wants to add $19.91 to a card and puts in a $20 bill. While I almost always use credit/debit, that’s not the case for everyone. Making change is definitely the limiting factor. In case you haven’t noticed, we live in 2013. A vast majority of the people now have credit and debit cards these days. Cash, like checks, are dying out. If you want to put in $19.91 on it, all you need to do is swipe your credit or debit card and it’ll automatically charge it or deduct it from your checking account. Besides, why would anyone want to still pay cash these days? You earn nothing when paying in cash. In contrast you earn cashback and frequent flyer miles using a credit and debit card. That’s far more rewarding than using cash to add value to TAP. If I’m going to ride Metro and decide I’m going to add $19.91 onto my TAP card, I might as well be using my 1% cash back using my Chase Freedom card to pay than fumbling around with wrinkly old $20 bill and coins. If anything, why not do this then? 2. How do you want to pay: cash or credit/debit? Please insert full dollar amount denomination bills that you want to load up your TAP card with. Please be advised that no change will be given. Your TAP card is now charged up with $5.00. Thank you. Your TAP card is now charged up with $19.91. Thank you. it’s just like depositing money at the ATM. You can only deposit full dollar amounts using cash, but depositing a check, you can deposit it down to the penny. If the OCR software can’t read it, you input it manually using the keypad. Think people, think! Because of your failure to think up of segregated options between cash payers and credit/debit card payers, you missed your opportunity to rebuttal against Metro’s lame excuses at the TAP meeting. Sheesh!